I'm Barry Petersen and this Letter from Asia comes from Tokyo. 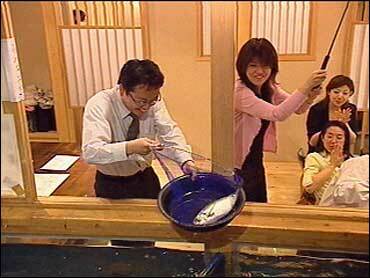 The Japanese are famous for liking fresh fish. But if what you can get at the neighborhood market isn't good enough, here in Tokyo there is another alternative where you can literally come eye to eye with your sushi course. At the restaurant Zauo, you can help yourself. No really, you HAVE to help yourself. If you want it, you first have to catch it. The middle of the restaurant is shaped like a boat and there are plenty of rooms alongside where catching can be a satisfying, if unnerving, experience for those will little experience fishing. One woman told me her experience was "only at a lake when I was little. Much easier than catching guys." In the water are 10 different kinds of fish from lobsters to mackerel. And once you get it on board there's the waitress and now the fun really begins. Your catch of the day is whisked to the kitchen where no time is wasted turning that swimming critter into a sushi delight. In minutes it's gone from fish to fancy; a course that costs more than 30-dollars. And every course rates a toast. Even the squeamish come away satisfied. "It was very fresh and chewy," another woman told me. "Very good." "Nice fresh food, sea food," one man said. "But I have one argument: too easy for fishing, too quick." We didn't ask, but we doubt the fish would agree with this lady. "I believe the fish are very happy," she says, "to be eaten by us and thought so delicious." So here even the most dedicated city dweller can learn what every fisherman knows - the pleasure of the catch is often equal to the pleasure of the meal - when you're angling for the freshest fish there is.